This is my first attempt to write a DirectX 9 program (I usually write program in OpenGL). I decided to implement a Light Pre-Pass renderer, my purpose of this program is to give a try on DX9, and try out different techniques, so the program is not optimized. Finally, the third pass render the geometry to compose the albedo color with the light buffer. 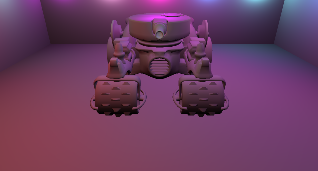 This screen shot show the depth buffer, normal buffer, the light buffer and the SSAO, rendered with 25 point lights. Currently, no ambient color is used. In the next post, I will talk about my SSAO implementation.